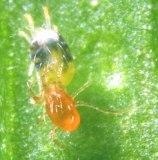 Phytoline p contains the predatory mite Phytoseiulus persimilis. This well known predator will eat large numbers of the two-spotted mite Tetranychus urticae. 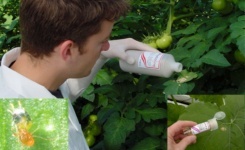 It is a standard treatment in many crops, particularly tomatoes, cucumbers, strawberries and ornamentals. It is available in a 250ml bottle. This predator is effective at a wide temperature range above 14°C and can be used outdoors as well. 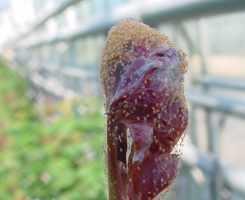 The adults and young stages feed voraciously on adults and eggs of the two spotted spider-mite and populations of Phytoseiulus increase dramatically at 20°C. At temperatures over 30°C the spider-mite growth rate will overtake that of the Phytoseiulus. It is important to start control measures as mites emerge from diapause in the spring, and to ensure elimination of the pest in autumn before the pest mites go into diapause.